The U.S. standard ASTM C1153 “Standard Practice for Locating of Wet Insulation in Roofing Systems Using Infrared Imaging” defines how the thermographic inspection of the roof to search for moisture problems. Flat roofs can be investigated both internally and externally in analogy with the walls, taking advantage of the thermal transients caused by the termination of insolation. In this case, after sunset areas of the roof that are moisture, invisible to the naked eye, below the waterproofing sheath, appear warmer (see image), since water has a higher thermal capacity of the waterproofing material and then keeps the heat longer. Must be carefully evaluated the presence and speed of the wind, which can cool the roof causing difficulty in detection of defective areas. The presence of moisture also causes a decrease of the local thermal resistance, for which the areas with water infiltration appear, from the inside, colder on cloudy days or in the early hours of the morning. The water enters the roof through the deterioration of the membrane, holes, cracks, joints or poorly maintained hot. 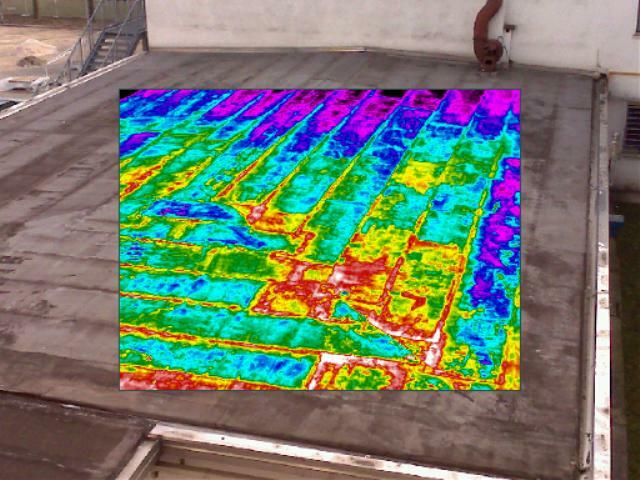 The thermograph has a “range of opportunities” to identify and document thermal anomalies due to moisture ingress into the roof. This range varies depending on the type of roof and weather conditions. Thermal anomalies also take on different appearances depending on the type of waterproofing used.